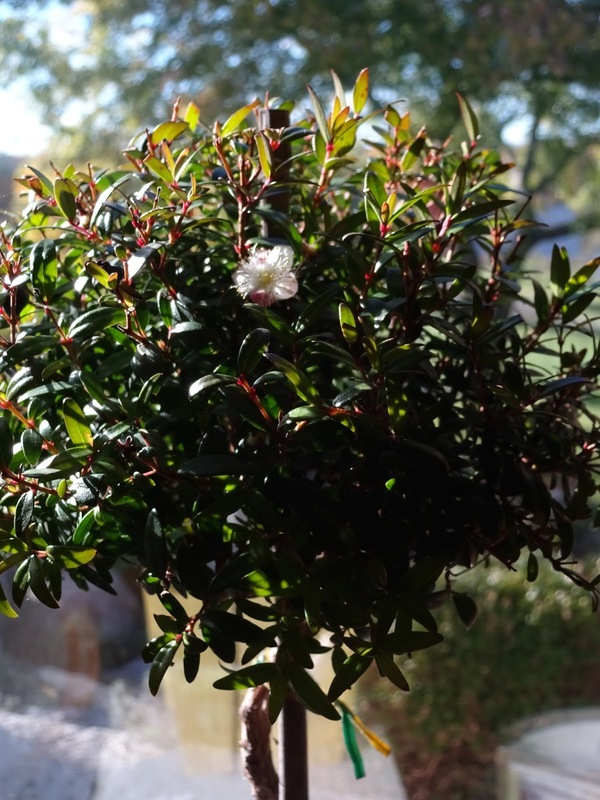 After four years of TLC, my potted rosemary shrub is budding and blooming. Considering Mediterranean plants don’t usually bloom indoors, I’m quite surprised and tickled—a bright spot on cloudy days. While I pruned the plant’s leggy, new growth in the basement yesterday, I recalled a sight when touring Inishmore years ago. As I biked the prehistoric, rocky isle, one of Ireland’s three Aran Islands, I passed rosemary hedges tall as a cottage. I cannot remember seeing the herb's lavender-blue blossoms. Rosemary is of the mint family Lamiaceae. The Latin meaning is “dew” for ros and “sea” for marinas. Ah, “dew of the sea.” The moniker fits the herb’s scent and locale. Well, Michigan is not the moderate Mediterranean. The best I can do during growing season is keep rosemary in full sun and convince her she’s sunbathing in Ireland or Italy. I feed her Mel’s morning coffee grounds and water her once a week. She prefers dry feet. Winter is a different scenario. There’s nothing pleasant about an expiring plant you’ve nurtured for several years and depend upon to season your roasted chicken and biscuits. Now our basement holds four new plants in mutual confinement. Rosemary must share her sunny spot with her companions. The Kentucky mint and spearmint are gifts from fellow herb lovers, so they must survive these long, dark nights to flavor our water. Come spring, mint goes back into the ground. Over a year ago, a friend sat a rosemary plant surrounded by thyme on my kitchen counter. The thyme eventually perished and revealed a young rosmarinas topiary that has since grown into a darling globe of fragrance and flavor. With pruning, I doubt the little plant will yield buds. Yet, a gardener never knows. Two Octobers past on a gorgeous sunny day, I spied golden specks on white blooms of my indoor sweet myrtle topiary. Sweet myrtle is another Mediterranean herb, commonly known as True Myrtle, Roman Myrtle, and Greek Myrtle. I bought Myrtus communis when visiting Grand Oaks Herb Farm in Bancroft two summers past with my Seven Ponds Friends of Herbs group. Beulah, the farm’s owner, operates a greenhouse supplied with an extensive variety of herbs and decorative potted plants, all edible. Beulah suggested the sweet myrtle leaves as a substitute for cooking with bay leaf. I’ve dined in Beulah’s barn before, so I snatched up a sweet myrtle topiary sprinkled with a few white buds. Dear Reader, although I gave up on African Violets, Boston Ferns, and orchids long ago, there’s no abandoning my few potted herbs to winter’s elements. Their culinary and medicinal properties alone are worth my effort and time. The ancient Romans and Greeks knew this. And I have a hunch Isaiah understood the significance of the myrtle tree. How sweet a bloom in captivity! The sight and scent fill my heart and home with grace and gladness.